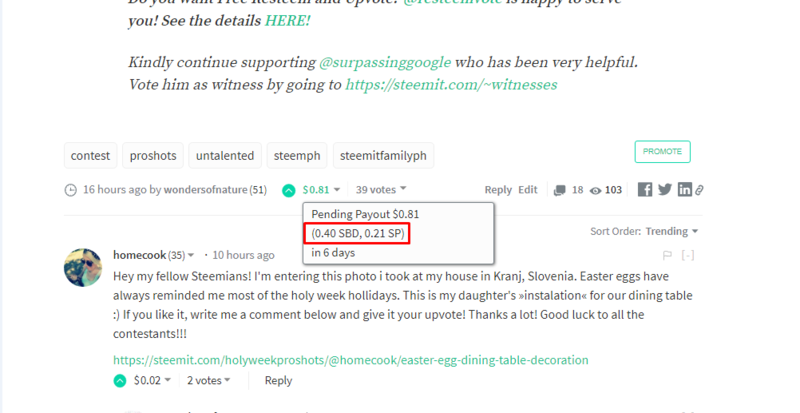 How to effectively Bid on Steemit Bots? It's another great day Steemians! 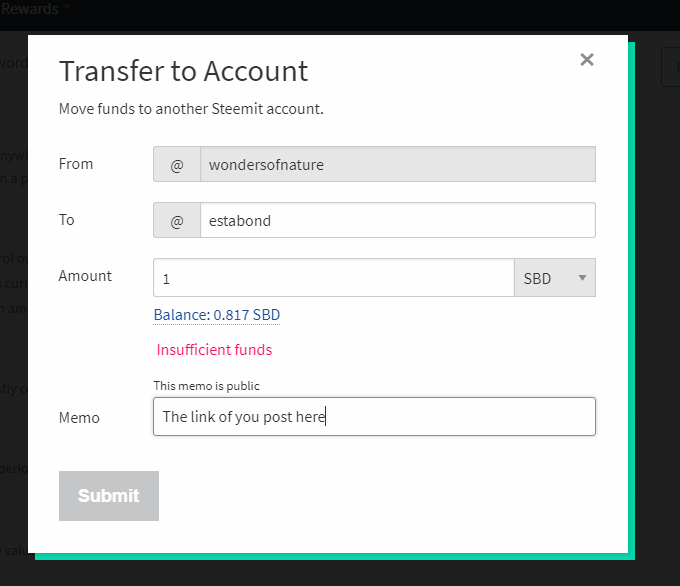 Steemit is indeed a huge and wide ocean for us minnows and it's very important that we understand every single detail to help ourselves grow in this community. I started here in Steemit without any knowledge, thus self-research was very crucial. One of the things that took me a lot of time to understand is the use of Bidbots. Some of you might not be aware what bidbots are. 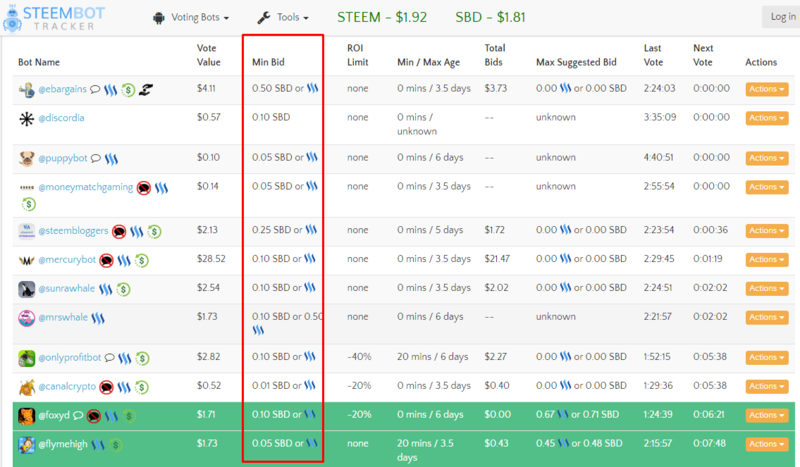 Bidbots are robots holding huge Steem Power and sell their upvotes to Steemit users. You can buy upvotes from bots by simply joining their bidding every 2.5 hours. 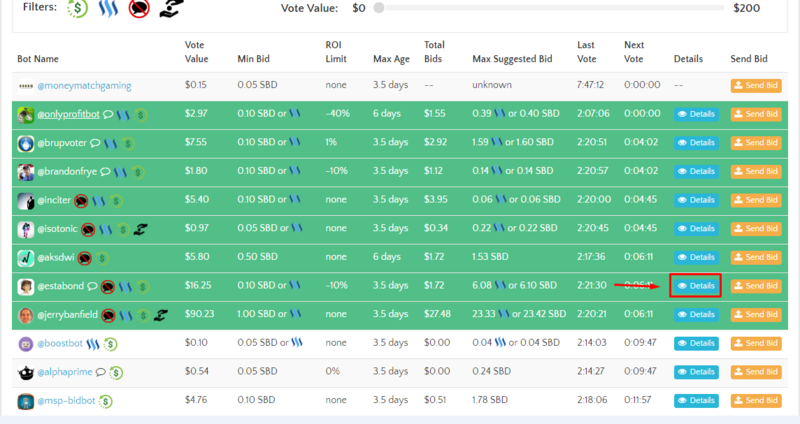 After 2.5 hours of bidding the bot will divide its 100% voting power among bidders, thus the value of upvote that you will receive will depend on how many bidders joined the bidding and the amount of their bids on the round. During my first month, I was so confused how bidbots works thus I experiment it myself. Without any knowledge, I spent SBDs to several bots and I was so happy how my dollar earnings on my posts increases. Thus, I was encouraged to spend more SBD for the bots. Unknowingly I have been relying on bots for already a month, until one day I realized that I was losing my SBD because the market price went down and that I was not wisely using the bidbots to earn SBD. 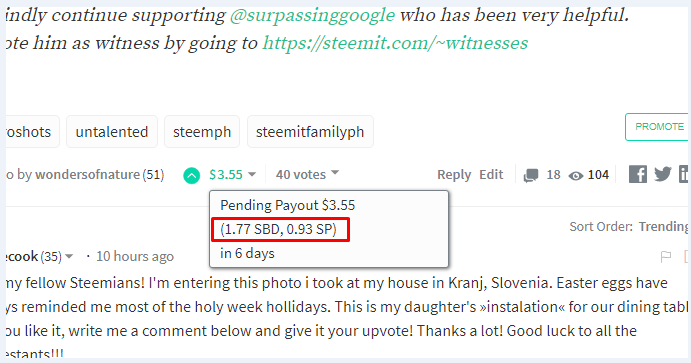 Despite not earning SBD that much, I gained Steem power, follower, and readers on my post. 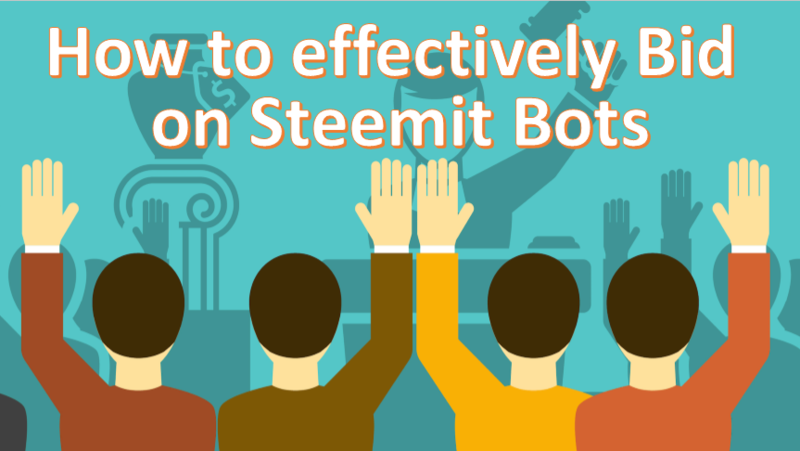 If you've read my previous post about the different ways How to get extra exposure in Steemit and the Different ways to acquire Steem Power you will remember that I discussed how Bidbots help get extra exposure and increase our steem power. I honestly can no longer afford to lose SBD because of bidding incorrectly thus I study how to effectively bid on Bots. 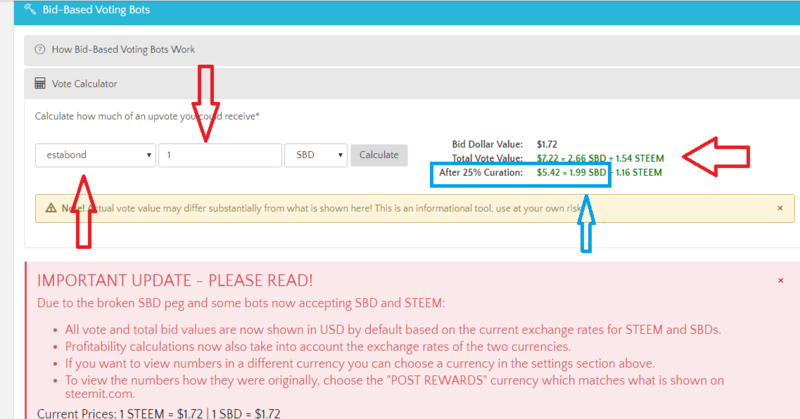 On my previous post Different ways to earn SBD/Steem in Steemit I mentioned that Bidbots is one of the many ways to earn SBD, however It will also depend on how you will do the bidding. Today I'm pretty much excited to share with you how I effectively use bidbots and I will try my best to provide you a clear comprehensive tutorial. Below you will see the lists of bots and the important tool that you will be using, the Vote Calculator. The Vote Calculator will show you how much potential upvotes you would receive in a particular bot with the amount of your bid. The Max Suggested Bid works like the "Available Bid Slot". 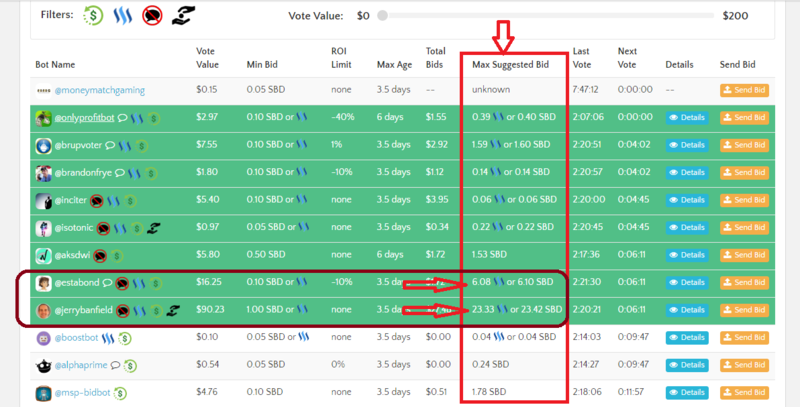 The higher the remaining SBD under Max Suggested Bid the smaller the chance of losing in the bidding. 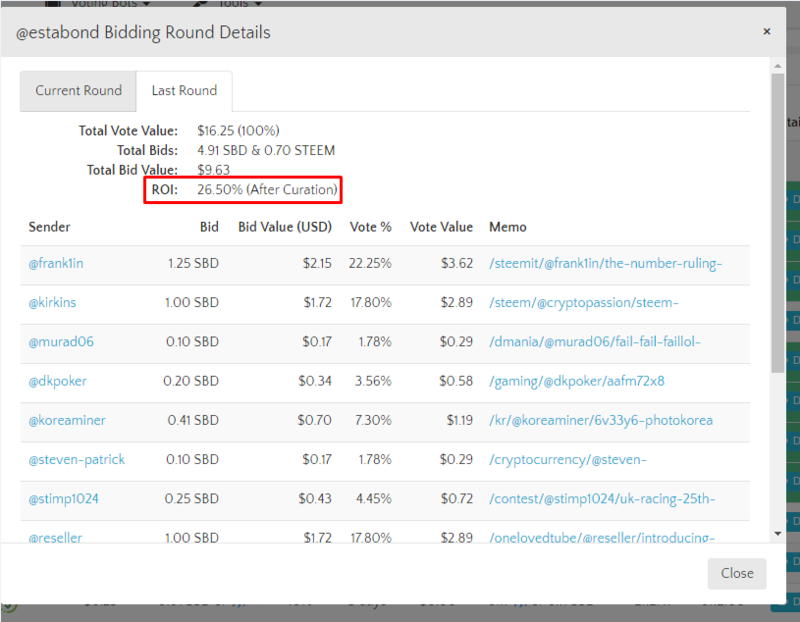 In the illustration above @jerrybanfield has the highest number of Max Suggested bid with 23.33 Steem or 23.42 SBD. That means @jerrybanfield can still accommodate bid of up to 23 SBD. Next to him is @estabond with 6.08 Steem or 6.10 SBD max suggested bid, followed with @brupvoter with 1.59 or 1.60 SBD max suggested bid and @aksdwi with 1.53 SBD max suggested bid . Clearly the bots showing the potential of winning is @jerrybanfield and @estabond. Step 2. Open the Vote Calculator. Check the Bots Min Bid to make sure that you are sending the correct about, although most bots send an automatic refund for invalid bid buts still better that you know the minimum required. 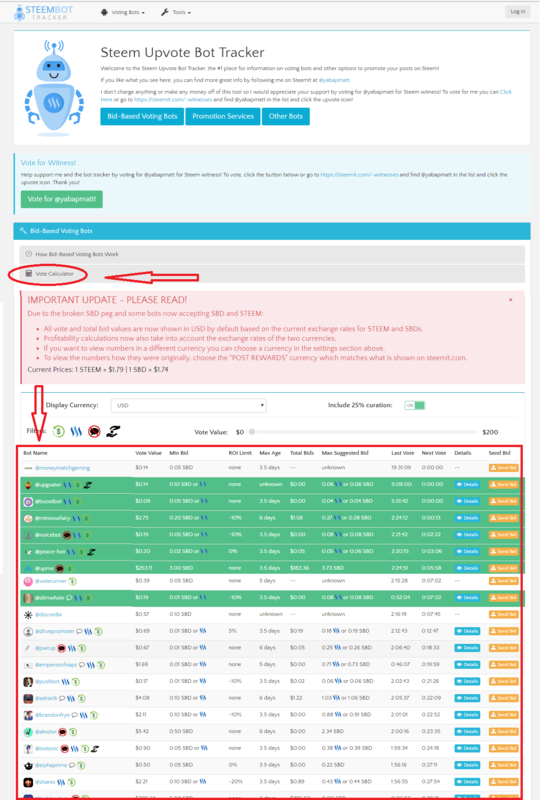 Find the Bot's name, type the amount of your Bid and click on calculate to get an estimate calculation of the upvote amount that you will receive. On the above illustration bidding 1 SBD to @estabond gives me 2.66 SBD vote value, but after 25% curation I will receive 1.99 SBD. That means I can possibly earn 0.99 SBD from my 1 SBD bid. I also tried computing @jerrybanfields vote value but it was giving me a bit lower vote value compare to @estabond. Why? Because @jerrybanfield has a vote value of $90.23 compare to @estabond that has only $16.25 thus bidder will bid for @jerrybanfield because of his high vote value. Nevertheless, the $90.23 upvote value will also be divided to several bidders thus it's giving almost same value or lower than @estabond who have fewer bidder. Therefore, it is important to check the Bidding Round Details. The last round was good as it's showing that bidder got an ROI of 26.50%. So I am closely monitoring to the current round to ensure that I will not lose in this round. So check back how many minutes left before @estabond next vote. 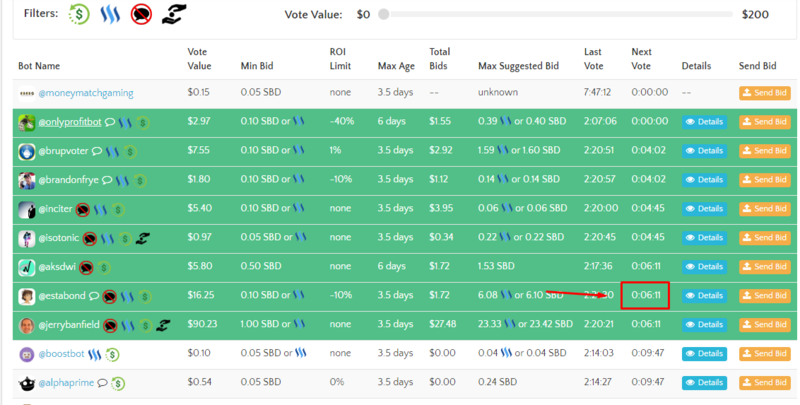 Currently, @estabond is showing 6 minutes remaining before her next vote, once again open the Details and check if a new bidder was added to the queue and check the ROI. The flow is quite good, ROI is at 468.00 % after curation that means I will surely win this bidding. So I should go ahead and send my bid before time runs out. Note: The system just updated the details section. You can now find the Details under Actions. Step 4: Send your Bid! Put the name of the bot, the amount of your bid and the link to your post. Tip! Send your bid when the timer was down to 7-5 mins to give yourself a little bit time to observe. Some bidders also send bid during the last minute and suddenly the ROI falls to negative. Thus, If you noticed that the ROI is decreasing, I advise that you should not proceed because you will end up losing. But in this scenario that ROI is at 468.00 % at 6 mins time, it's already a Win situation. Step 5: Wait for the upvote! While waiting for the bots upvote, I checked on the current upvotes of my post. Do you think I won the bidding? Yes I did! But remember! The market price of SBD also affects our earnings. Thus, if the SBD price goes down, your earnings is also going down. Not unless the price bounces up before your post reaches 7 days. Find the perfect time of the day when there are only a few bidders. At GMT+8 time zone, the perfect time of the day for bidding is every morning when other bidders in the opposite time zone are sleeping thus, there are only a few competitors. 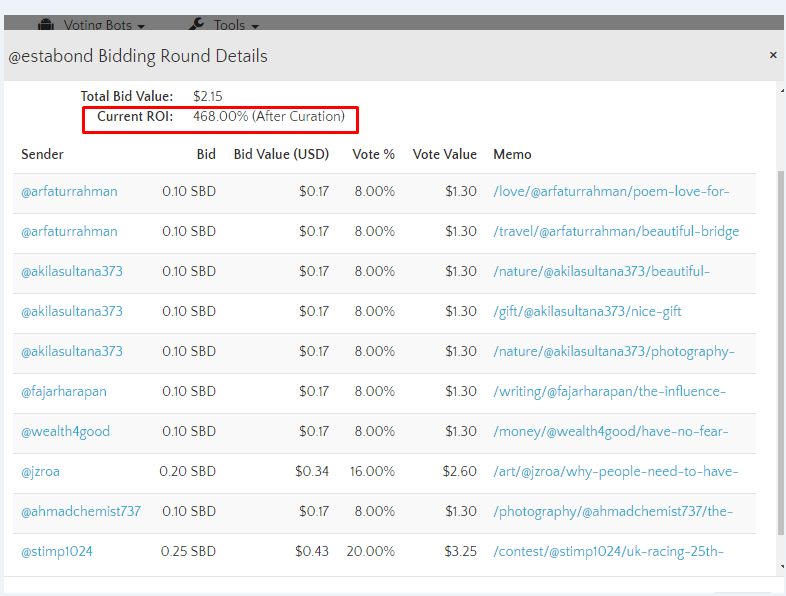 One secret to win a bid is finding the bots with very low Total Bids with vote value of not less than $1. 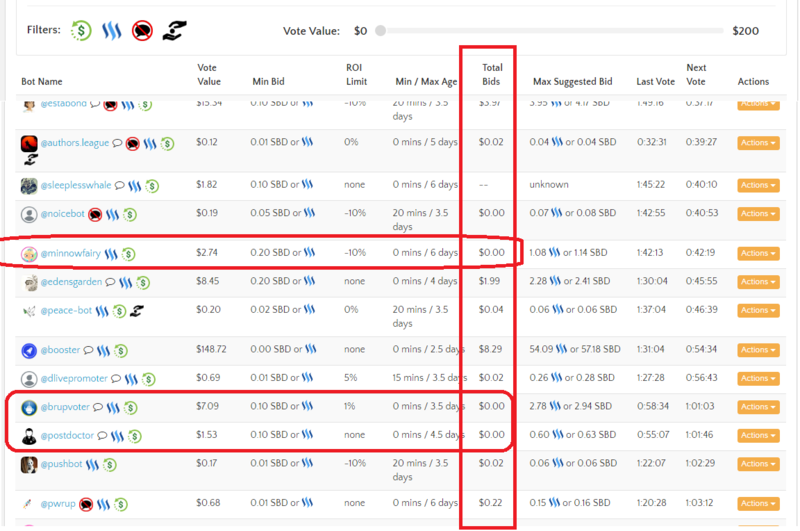 On this illustration, there are 3 bots that have 0 Total Bids that means no one is bidding yet. Thus, if you bid for the bot you might possibly get its 100% upvote. So you need to watch out for that bot until its time goes down to 7 minutes and see if a new bidder comes in and the amount of their bid. It's also a good idea to bid a bit higher on the amount of their bid to get the bigger share. When the Bot's timer goes down to 5 mins yet no new bid comes in then it's time for you to play Wisely. Check the Min Bid and bid only for the minimum. Why? because since you don't have a competitor, bidding even on its minimum bid will still give you the 100% upvote. If you are a good bidder who's currently reading my post and wanted to share some of your tips, you are very much welcome. On my next post I will share with you How to Lease SP on Minnowbooster. Thank you for taking time to read this loonnngggg post. haha. But I hope you learn something. Have a nice day! Do you want Free Resteem and Upvote? @resteemvote is happy to serve you! See the details HERE! Kindly continue supporting @surpassinggoogle who has been very helpful. Vote him as witness by going to https://steemit.com/~witnesses.